Have You Ever Wanted to Change the Past? Home » Blog » Have You Ever Wanted to Change the Past? What if we can change our past? What if we can go back in time and do it all differently? Would our future be better? Would we be happier? Scotch effectively illustrates how our past leads us to exactly where we need to be. 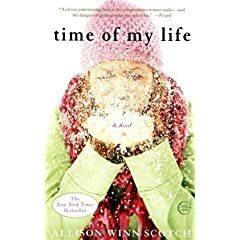 In “Time of My Life,” the protagonist, Jillian, appears to be going through the motions of motherhood after the birth of her first child, Katie, and can’t help but feel something is not quite right in her suburban life and marriage. She and her husband, Henry, no longer connect the way they used to, and she sometimes finds herself pining for what once was — the intense relationship she had with her ex-boyfriend, Jackson, and the fulfilling work she did at an advertising agency in New York City. So when Jillian goes to get a massage and her masseuse “unblocks her chi,” where she travels back seven years into the past, she is very content to embark on a second chance. Despite an ongoing ache of missing Katie, she initially enjoys reaping the benefits of being brought back to that highlighted time of her life. She’s able to thwart the petty fights with Jackson (for she knows what’s coming), and she even saves her friend from undergoing serious complications during her miscarriage. Similarly to the popular film, “Groundhog Day,” Jillian is living in the past, aware of what is ahead, and convinced that she has the ammunition to deal with the bullets that would be thrown her way. However, as big issues with Jackson begin to rear their ugly head once more, and Henry still manages to appear in various settings hoping to win Jillian’s heart, Jillian starts to question if her old life is really what she desires. After she starts to piece together unresolved concerns regarding her mother leaving her family at a young age, she becomes aware of some painful realities about herself and learns that maybe it isn’t the past that she really longs to change. Tinybuddha.com features a blog post by Adam Alvarado who writes on this very topic — on pondering what could have been. “Ever thought about where and who you’d be if only you’d done something differently, gone somewhere else, chosen something or someone else?” he says. Instead of backtracking into a cycle of “if only” and “maybe if,” he assures us that our past choices fatefully led to the present we are meant to embrace. He didn’t like the thought of wondering what his life would have been like if he choose to go to a different college, for example. Do you still wish you can get a do-over? As tempting as it sounds in theory, it’s comforting to trust that you are on the path that is right for you. Would you still like a do-over, or do you see how your past choices have led to the life you have today?